Andalucia reflects the unique blend of Moorish and European designs found in Seville, Cordoba as well as Granada in southern Spain, revealing both their ancient influences and modern sensibilities. 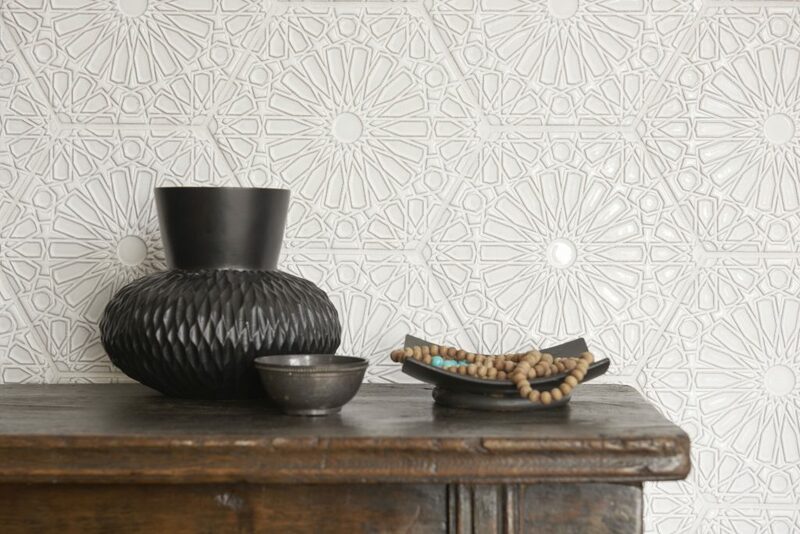 The two large-format hexagon tiles, “Marrakesh” and “Fez,” are each named after Moroccan cities and feature patterns that create an infinite variety of mesmerizing geometric interactions. Additionally, the 10-by-10-inch design “Puerta” (Spanish for “door”) is directly inspired by an intricately detailed door near Walker Zanger’s San Miguel de Allende factory. The “San Miguel” design finds inspiration in the Mexican city’s famed baroque Spanish architecture with its layered geometry of a hexagon on a diamond. “Each Andalucia tile emphasizes intricate reliefs and patterns layered over one another to create an elaborate design with a modern aesthetic,” said Becker. “You can arrange the relief and flat tiles to design an ornate statement wall or distinguished focal point.” The cool color palette mirrors Moorish motifs, including shades of white and numerous subtle blues, all in a sophisticated antique patina. To see the architectural design inspirations and layered geometric patterns of the Andalucia collection, visit http://bit.ly/AndaluciaWZ.